This post is part of the PITMAN Birthday Sale Week - check it out HERE! As planned long before, we take part in the 7-Day-Roguelike-Challenge 2012, and currently are making a roguelike with AS3/Flashpunk. With less time at our hands, we wanted to have a smaller scope than last year (when we did "Pitman Krumb"), which basically means: no 3D (but pixel art instead), no big story or anything, only one dungeon and RPG elements next to zero. Think "3DRL" instead of "7DRL". Still, there should be at least one interesting gameplay mechanic, and this will be the INFINITY. Before I explain this Infinity thing, here is the rough premise: In "Me Against The Mutants" you play a liquidator, trying to get rid of the radioactive material lying around everywhere and, which wasn't really part of the job, killing some mutants. You can walk around and hit enemies - simple as that. But as you're pretty weak, mostly weaker than the mutants stumbling around, you get a device ... the Infinity Generator. With it you can create rectangles which extend to infinite space (think Portal, but top-down 2D). At least that is the plan, currently I don't know a) if I can implement this device and b) if it really works as main gameplay. But this was another goal of us - the game should be a little bit experimental. This is true for me (programming the Infinity device) as it is for Jana: we never did a (more or less) full 2D game together, so there is enough new material for both of us to learn. 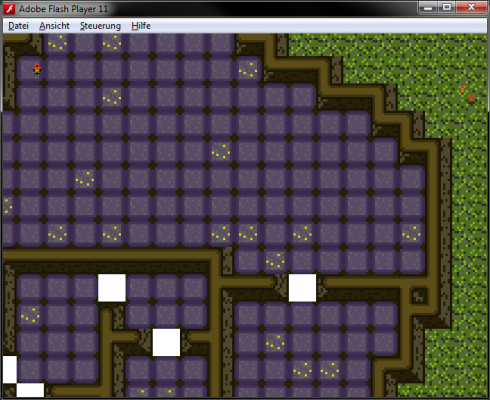 A dungeon gets generated. As the world in itself always has the same elements - a big forest, with some kind of building in the middle - this is how it always looks, but slightly different every time you start the game. The shape of the building varies, and the number of rooms. I did a small test of the dungeon generation algorithm beforehand, you can have a look at it here. 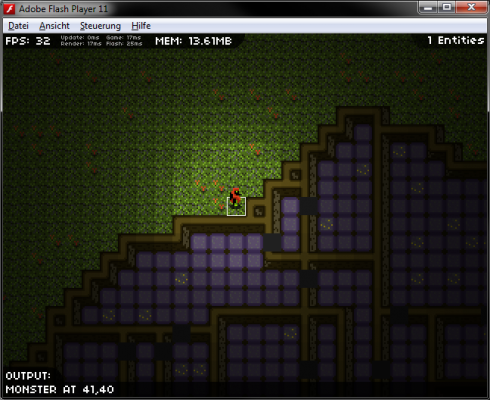 Different graphics for forest, building, walls. The main character (four directions) walks around - not finished. And that's it. Not very much, I expected to be faster programming-wise, but using a middleware I'm still not 100% proficient in is always holding me back. And as I don't use the Entity system of Flashpunk as it was meant to be used, it feels much less high-level, and I have to rethink many things; I even get the feeling that I do some things for the first time, which isn't that much fun. So, even though I wanted to have the (basically) working game after this weekend, I might want to put more work into it during the week. And while you're here, check out the other 7DRLs in the making!